Can we just pause for a minute to bask in the glory that is “Murder, She Wrote?” Thank God for Hallmark showing this on TV – several episodes, every night. My sons are even getting into it. They like Jessica Fletcher, played to perfection by Angela Lansbury. Well, really, Angela Lansbury is perfection, that goes without saying… But Jessica is just awesome. She doesn’t judge, she’s compassionate, she’s really smart, with an eye for the smallest detail that could be a clue, and she is deeply loyal to her friends. And man, does that woman have a lot of friends. 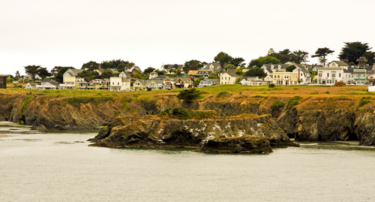 Distant relatives, old college chums, former neighbors – she’s got connections all over the world, and when she’s not in her home of Cabot Cove, she’s off visiting one of them. That’s the excuse to take her to the next murder, of course. But “Murder, She Wrote” draws you in, not just for the mystery itself, but for the unparalleled stable of guest stars. It’s a veritable “Who’s Who” of Hollywood. I have actually bookmarked the “Murder, She Wrote” page on the Internet Movie Database, for quick and convenient reference – because God help me if I don’t have my phone handy and I get sucked into an episode. “Oh, that guy,” I’ll say. Then I have to pause the show and go look him up. It’s Bo Hopkins, playing Lt. Ray Jenkins, in “Armed Response,” Season One, episode 19. And how do I know him? Well, let’s check the old IMDB… oh, looky here, he was on “The Andy Griffith Show” in 1967, in the episode, “Goober the Executive.” And then, of course, I have to take a minute to ponder the glory of George “Goober” Lindsay, because I loved him and that show. But I refuse to get sidetracked for too long, because here Bo is on “Bonanza” in 1969, playing Stretch Logan in the episode, “The Witness.” He was in a couple episodes of “Mod Squad,” but I skip over that because I never really got into that show – and may I point out, lest you think I am considerably older than I actually am, that I saw all of these early shows as reruns on after-school TV in the seventies and eighties. But back to Bo Hopkins… how do I know him? Oh, he was on “Hawaii Five-O” – the real one, of course, with Jack Lord as Steve McGarrett. Nope… here we go: he was on a bunch of episodes of “The Rockford Files,” as a character named John Cooper. And on two episodes of “Charlie’s Angels,” one in 1976 and another in 1979. And he was on “Dynasty!” Dang, he played Matthew Blaisdel. He’s still alive and kicking, got a couple things in post-production. Good for him. Whew! Now I can get back to the show. Holy cow, that was Eddie Bracken! God bless him, he was brilliant in “The Miracle of Morgan’s Creek,” the 1943 comedy written and directed by the wonderful Preston Sturges. Betty Hutton was in that with him, what a hoot… No, I must get back to Jessica Fletcher! Last night, my son, Josh, and I were watching an early one, Season Two, episode 1, “Widow, Weep for Me,” from 1985. I do believe this is the first one to feature the recurring character Michael Hagarty, an Irishman played by Len Cariou – who, I now know from IMDB, is actually Canadian. “My God, that’s Cyd Charisse!” I said to Josh. “Who?” he said. “You remember “Singin’ in the Rain?” He vaguely did. Note to self: make him watch that incredible movie again. It’s part of his cultural heritage. “She was a dancer, and she could do this vertical split, it was just incredible. Her legs seemed to be longer than Gene Kelly. She was amazing. The song was ‘Gotta Dance,’ and Gene Kelly was tossing this coin up in the air…” But in this episode, she’s secretly married to Mel Ferrer at this luxurious tropical resort. Howard Hesseman was on this episode, too, as a shady cop. “He was on this show called WKRP in Cincinnati,” I explain to Josh, “playing a deejay named Johnny Fever who got fired for saying the word, ‘Booger.’” In an age where people routinely scream the F word, Josh found this hard to believe. Yes, it’s a treacherous web, that “Murder, She Wrote.” One must tread cautiously. Let us remember Daedalus, the genius inventor from ancient Greece – who, among many impossible jobs, was tasked by King Minos to solve the unsolvable puzzle of stringing a thread through a conch shell (this in itself was part of a plot to trap Daedalus, but let’s just try to stay on the path here). Daedalus poked a hole in the conch shell, smeared it with honey, and tied a string to an ant. The ant wound its way through the spirals of the shell, taking the string with it. So the moral to this story is, when you watch “Murder, She Wrote,” keep a tether nearby, lest you get drawn into the many twists and turns of Memory Lane and stay there for hours – or, at least, until the next episode. Don’t miss any of my posts, adventures, and observations. Sign up for my email newsletter today. 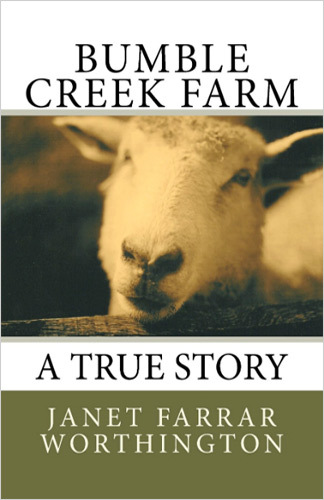 A delightful true account, told with love and humor by award-winning writer Janet Farrar Worthington, of her young family's riotous adventures on their own "Green Acres," as two urban professionals "who had no idea whatsoever what we were doing" start a farm in beautiful Horse Oak, Virginia. 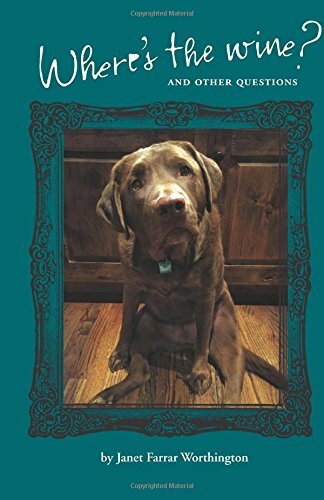 Janet has done it again in this charming book giving happy little snapshots of home and family, animals with attitude, life in a small town, and finding the funny when everything seems crazy.